Before discussing "Brick and Mortar and Love," which is a documentary dealing with the current state of record stores, I feel that I should first address my personal experience and biases. First and foremost, I am an obsessive media collector and have been for most of my life- starting with records in my childhood, later cassettes and then being lucky enough to have access to a CD player when they were still relatively new, and then branching out to video formats as well. As a kid, going to record stores was always exciting for me, and today I still find a lot of joy in going to record stores and spending countless amounts of time perusing the selection and finding things I haven't gotten around to buying yet or may not have known existed. Whenever I visit anywhere outside my area, one of the first things I do is find and visit any record stores that may be there. Music and video formats brought back from trips serve as mementos to me. I know this may not hold the same for others. I should also say that I worked at the main office of Tower Records in West Sacramento, CA, in their online department (you may have talked to me if you had called their 800 number) during the last five years the company was in business. When I had begun working for Tower, I had hoped that I would have spent the remainder of my working life with the company. I had dreams of having a part in running one or more of Tower's retail locations, but in 2006 after two bankruptcy filings the company was sold to a liquidation firm which sold off and closed its operations. This was a very heartbreaking experience for me as Tower represented something I loved very much: a place to find and discover media with people who celebrated its very existence. Having lived near Sacramento for many years, it also gave me and others a sense of pride to see a business that was started here locally grow to a nationwide and eventually worldwide retailer (while still managing to keep a relatively un-corporate and independent spirit at most of its stores), and seeing that die was also extremely heartbreaking. It has also been disconcerting to me to see the resulting effect Tower's demise has had on the media industry, as it has given companies considerably fewer outlets to sell items with limited appeal. This has been discussed in depth on the forums here. That said, let's discuss the documentary. 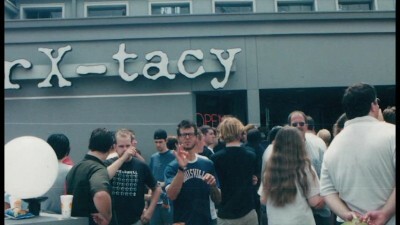 Although it's been promoted as being about independent record stores in general, and does show a number of stores in various states with comments from their owners, the primary focus here is on one store in Louisville, KY called "ear X-tacy" (another disclosure: I have never been to Louisville and no knowledge of this store other than what has been presented here.) 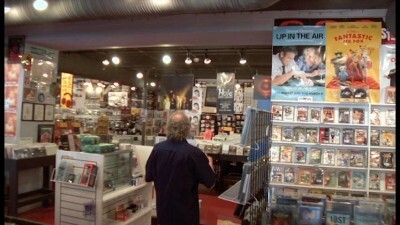 Director Scott Shuffitt, a Louisville resident, began production after hearing about the store's troubles. 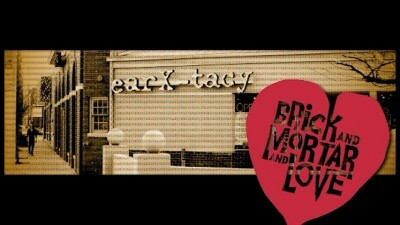 ear X-tacy (the "e" intentionally not capitalized) was started by owner John Timmons in 1985. The store experimented with a couple locations until finally settling on a large building vacated by Pier One Imports, where it stayed for several years and became a large part of the city's culture. In addition to carrying a large selection of media, it also featured in-store performances from local and visiting bands. 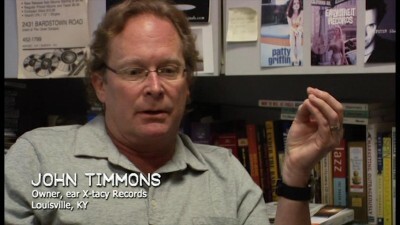 Timmons is shown on-camera stating that his goal was not just to sell music, but give Louisville a place for music lovers to gather and discover things, and gave his staff the goal of sharing their enthusiasm and knowledge with customers which he points out is something that rarely happens at stores like Target. However, for reasons that aren't disclosed, by 2010 ear X-tacy ran into problems that threatened its ability to stay in business, and Timmons held a press conference bringing out in the open the possibility that the store may be in danger of closing. Snippets of the conference are shown, where Timmons stresses that he isn't asking for a bailout or a handout, but does urge people to remind their friends to support the store to help keep it open. From this point, we learn that while there were a few detractors who said that record stores were "a by-gone industry," many Louisville residents showed their concern, including starting a "Save ear X-tacy" Facebook page, and made an effort to patronize the store more. We see plenty of footage of customers coming into the store and talking about what it means to them, as well as owners of other record stores talking about what a difficult decision it would be for them to "go public" with any problems with their businesses. We then learn that the increased support was at least for the time being enough to keep the store in business but not enough to sustain its location, so Timmons decides to move to a smaller location and the documentary shows him informing his employees of this. Most customers are understanding and supportive, lining up outside the new location the morning it opens. We see the store have a successful "Record Store Day", a worldwide annual event held at most record stores beginning in 2007 (right after Tower had closed, and formed in part by Tower founder Russ Solomon) as a way to spread awareness of record stores in general to people who may not have ever patronized or had simply forgotten about them. However, we see Timmons struggle with the realization that he is still having problems with his business even with lower overhead, and he again makes an announcement to the public about possibly going under. This time a benefit concert is held with local bands in an effort to save the store, from which a few clips are shown but no complete songs. SPOILER ALERT: I debated whether to reveal in this review whether this move proved successful for ear X-tacy or not- the documentary presents everything chronologically, so watching this with no other knowledge the viewer does not find out until the end, and normally I do not like to discuss how a movie ends in my reviews. To those in Louisville, it will obviously not be a surprise to them, and I found it difficult to not discuss it in this case. Therefore I will go ahead and say that ultimately, Timmons is forced to go out of business, and thus "Brick and Mortar and Love" in its final form becomes a testament to ear X-tacy and serves as a reminder to those of us outside Louisville of what record stores in general mean to some people, and how devastating it can be to lose them. I felt like crying after learning how this story ended. Although this documentary's purpose is to reinforce the importance of record stores, it may just be preaching to the choir. I don't know if watching this will sway anybody who isn't already a passionate music collector- even when record stores were more prosperous, with online alternatives not yet in existence, there were still those who just bought albums to listen to one song they liked, and may not have cared about the packaging or the general experience of listening to an album. It would have also been helpful to show the store's situation from a business perspective as well- what exactly caused ear X-tacy to fail? Were its sales simply too low, or was the owner also not controlling his costs effectively enough? A more in-depth history of other record stores in the area would have put the situation in a better perspective for us outsiders as well. I don't know how many other record stores were in Louisville when the events shown here took place, or how they are faring now. "Brick and Mortar and Love" was shot on video (possibly HD, downscaled for standard DVD) in 16x9, though there are slight black bars on the sides of the screen. The frame rate is 24 frames per second, which I personally don't care for on video-based material but overall it looks OK and not too "cheap", considering this is obviously a very small production. Audio is in 2-channel Dolby Digital. The location audio was recorded in mono, with some stereo music and a few sound effects overlaid, with the benefit concert footage in stereo. Everyone speaking on-camera is miked well enough to hear clearly. How one feels about "Brick and Mortar and Love" will depend largely on their existing feelings about music collecting. For me it was a rather emotional experience, but I'm already a long-time collector and witnessed the closure of Tower Records first-hand so the events shown here hit home for me even though I've never visited Louisville. Others may wonder just what the big deal is. There are a few other documentaries (including "I Need That Record" and "Last Shop Standing") which tackle the same subject with attention given to more stores than this one does, and I feel they should all be seen by those who love record stores and want to see them continue to survive.